Woo-hoo!! I got my package from Running Warehouse today!! 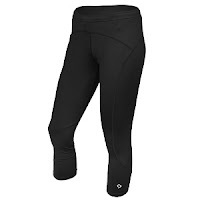 I ordered two pairs of running capris, hoping at least one would work. I bought a pair at Target last week but ended up taking them back out of fear of chafing (down there) because the seams weren't flat like they are in "real" running gear. I also got a foam roller. It has been on my to-do list since I went to the doctor last week. Better late than never. I'm going to start putting it to good use today!! Knickers!! Haha, I love them, and actually might copy your train of thought in purchasing them. Where did you find them?? The weather here has been between rain and extreme heat...so these may cover both bases! How goes the stretching and ice? Happy running!! Running Warehouse is my favourite online store! If you're not getting a team discount when you order, let me know and I can send you a "code" to get 15% off. Hope you enjoy the new pants. I test-drove mine today and loved them more than I thought I would. You will LOVE the foam roller, I was using mine all week and don't know how I did without!! I like Running Warehouse, too! Hope you let us know how you like the foam roller. I still don't have one. Love that you bought the knickers! You are sooo stinkin CUTE!! A giveaway... What? What? I need to try the foam roller... my calves tend to get tight. Everybody that uses one swears by it, so I guess I'll have to jump on that bandwagon. The foam roller is great. I hope it works for you!